The Tummy Tales: Vorn- Mangalorean Green Gram Pudding- Celebrating 100 likes on the facebook page. Vorn- Mangalorean Green Gram Pudding- Celebrating 100 likes on the facebook page. A very special dish for a very special occasion. This recipe is by none other than the original masterchef herself! Yes, it my mums recipe and a Mangalorean classic, Vorn (pronounced- War-rn). So then, what’s the special occasion? Well friends, my face book page has reached 100 fans and that calls for a celebration, doesn’t it? Remember, I told you special dish for a special occasion. Thanks a ton, dear readers, without each of you being there to cheer me on, this would not be possible. And yes, a special mention to my mum and sister who have been the backbone of this blog. Tasting, criticizing, cheering, suggesting and almost everything backstage is done by them and their input goes a long way in deciding what goes on the blog and what is left out. It was only obvious that I would choose Vorn for this post. 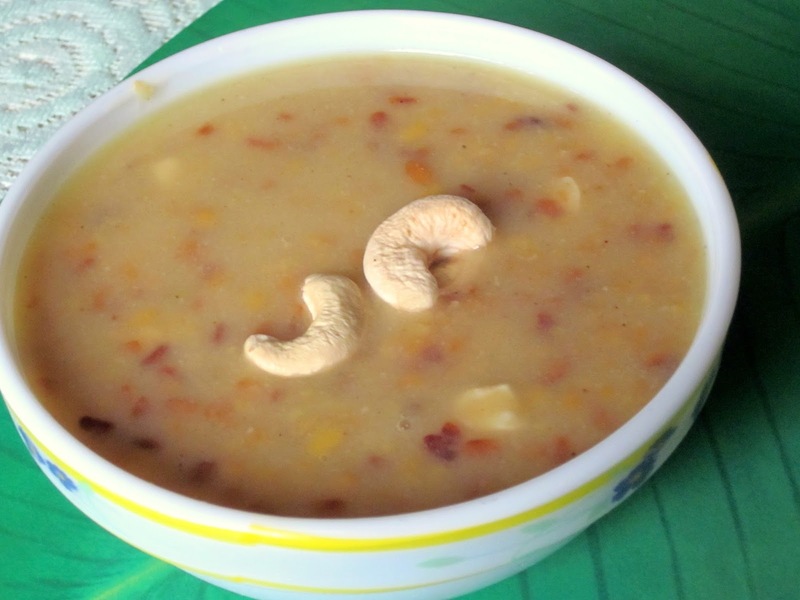 It is a sweet dish reserved for very special Mangalorean functions. I remember, sometime back I attended about 3 weddings in 4 days and then there was roce (which is the pre-wedding function) & every roce had vorn. Just goes to show what it means to us Mangaloreans. I remember my mum and even my grand mum making vorn in a large vessel that was specially reserved only for that purpose. As with most Mangalorean recipes, this one too doesn’t have a standard recipe, each household claims theirs is original and authentic. We’ll leave it to the food historians to investigate. Now, vorn is best had when it is piping hot, straight out of the cooking vessel. Whenever, mum makes it, I readily volunteer to do the tasting bit. When I was younger, I would deliberately sneak into the kitchen and ask that I taste the vorn at almost every stage of the cooking process. Complex as it may sound, it’s fairly simple to make and doesn’t require any alchemy. Just a few household ingredients that are readily available in the everyday pantry and your set to wow your family, friends or guest. And if you are of the diet conscious sorts who cringe at the mere mention of desserts, worry not. This one’s for you as well since unlike other oil/ ghee laden desserts this one doesn’t use any fat. Indulgence at its best!! And before I began writing, I promised my self that I would keep the post short and sweet. The dish has enough magnanimity to carry it through. As I always believe, food tastes best when eaten with love and shared. I do hope my dear friends you will try this recipe and share it with your family and those who you love. Dry roast the moong dal in a pan till it is golden brown on all sides. Once its brown, rinse twice under running water. In a deep vessel, boil the dal and the water together. The texture of the dal should be whole but not entirely mashed. Once the dal reaches this stage, add the jaggery and stir well. The jaggery should melt entirely. Add the cardamom powder and the mixed dry fruits. Keep stirring well so that there are no lumps in the liquid. To make the rice paste, soak (any variety of short grained) rice in water for about half an hour and then grind to a liquidy paste. Add this paste to the vorn mixture. When you add the rice paste, the vorn will attain a thick consistency. Reduce the heat and add the coconut milk. Stir well. Ganish with dry fruits and serve hot.